This can also be supplied in 5 kg units on special order. A Specifically and critically manufactured silicon carbide and lithium grease based grinding compound in a larger 2.5 Kg plastic bucket for industrial use. 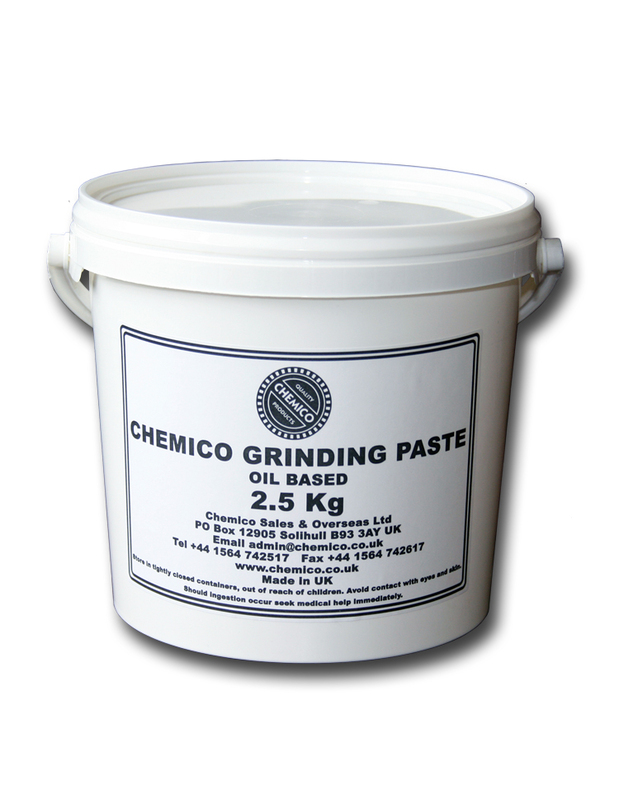 Chemico Grinding Paste has a lithium grease base, specifically formulated and manufactured solely for Chemico Sales & Overseas Ltd . The high-viscosity, high-temperature lubricant provides inherent shear stability, that is the lubricant remains in place during the grinding operation for the most efficient grinding together with inherent corrosion protection and good sealing properties. General Engineering. Tool making. Lapping, grinding and seating valves in engines. Hone cylinders, lap out score marks and remove burrs on metal. Lap shafts into bearings. Lap nuts into bolts. Lap cylinder heads, connecting rod and crankshaft bearings.